A blend of Hatha, Ashtanga and Jivamukti, suitable for all levels because I will modify for you! 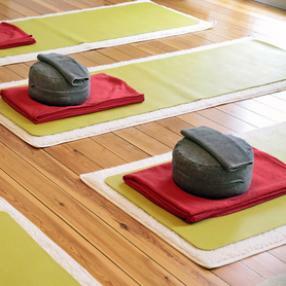 A gentle practice that focuses on the principle of support, self-care, mindfulness and ease. The aim is muscular release. The use of props such as bolsters, blankets, straps, blocks assist in helping you to hold and support poses longer while maintaining a comfortable, neutral shape of the body, so you can linger in the pose quietly. As your body relaxes, the stillness allows us room and space to see clearly, find our natural state and just be. le Dharma Vinyasa est une pratique qui se caractérise par une attention toute particulière à l’énergie du souffle et à l’alignement postural et énergétique. Pratique douce et dynamique, aussi bien que méditative, le Dharma Vinyasa encourage la conscience du corps, du mouvement, de la respiration, dans des séries créatives et toujours adaptées à chacun. one posture to the next - a vigorous and challenging class. Expect to sweat and leave the class feeling energised and relaxed. knowledge of basic postures is highly recommended prior to joining this class. All-level yoga class suitable for beginners and also for intermediate practitioners. A wonderful way to unwind after the day with 75 minutes of Yin Yoga. Yin yoga’s slow deep stretching helps to release accumulated stress, tension, emotions, while increasing energy flow and flexibility. Come and discover the magic of this slow meditative practice! Suitable for all levels and beginners are welcome.